Report in effort to help those not catching fish. I had the day off today but did hear from guide friend that today was slow.There has been some tougher fishing the last couple weeks for walleye but we are catching walleye and other species. Here is an account of the fishing yesterday, a day when the fish "weren't biting". If customers enjoy eating fish I enjoy sending them home with some boneless filets and or providing a shore lunch. The picture above are the fish we elected to keep. 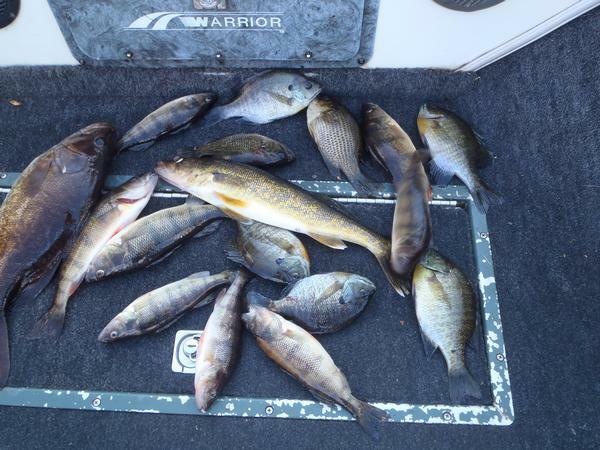 I have only been counting walleye this year, we caught 7 yesterday(had some missed fish) but only kept 1, the other 16 fish we kept were a mixed bag ,we also caught a lot of smallmouth and small perch, bluegill and rock bass, probably 50 or 60 fish total. I am used to measuring my success in walleyes caught, it was a very slow day for me, my customers however did have fun. Here is a rundown of what we fished in order, caught some fish on all spots except one: 1.- 6' hump, stumps mostly sand bottom 2.- 7' hump mostly rock bottom,a few scattered stumps 3.- 9' hump softer bottom big stumps, 4.& 5. 10' flat anchoring and fishing waypoints with heaviest concentration of wood, 6. 10' hump with clay bottom some wood and boulders 7. 4' log jamb with the wind pounding in (disapointment only spot where we caught nothing), 8.9' submerged bog. Did fish pretty shallow because of the big winds if flat go deeper 12-15 or shallow weeds 7' is as deep as they go most of the cabbage is 3-5', or shallow concentrations of bigger stumps. If still no fish consider hiring myself or one of the other Mercer guides I have thur. and sun.open. You will catch fish.